Beachfront condo #101 is a 2 bed/2 bath ground floor corner unit in building 1, on the north edge of the property. It is a prime spot for swimmers; simply step off your lanai and take a few steps to get to the pool, then a few more to be on the white sands of Sugar Beach. It’s a beautiful spot. Pick up some local fish & produce to prepare on the property’s gas grills or in your unit’s full kitchen, then eat this feast on your lanai while you appreciate paradise. The master bedroom has an en-suite bathroom, koa wood furniture & king-size bed. The second bedroom has twin beds & a second full bathroom. With a sleeper sofa in the living room, the condo is suitable for up to six guests. Central A/C & ceiling fans keep you cool while complimentary Wi-Fi & cable TV keep you entertained. The in-unit washer/dryer is super convenient. They cancelled our reservation at the last minute due to failed a.c. unit and we had to take unit 101. Right next to smoking area so it smelled, right next to pool so it was loud, and didn't have the view we booked. No offer of compensation for taking this room. Dishes were dirty and this wasn't worth it. Beach is about 4 ft wide in front of this area. Book somewhere else. Thank you for your feedback and we are very sorry to hear about your experience. The manager did present you with options and asked to communicate any concerns you may have had. Please get in touch with us and we will be happy to discuss. Aloha. We love to stay at this property.. its right on the beach with gorgeous views! Conveniently located across the street from a farmers market and sugarbeach bake shop and Ululanis shave ice! Simply the best! We are so happy you enjoyed your time with us! See you next time! Aloha. 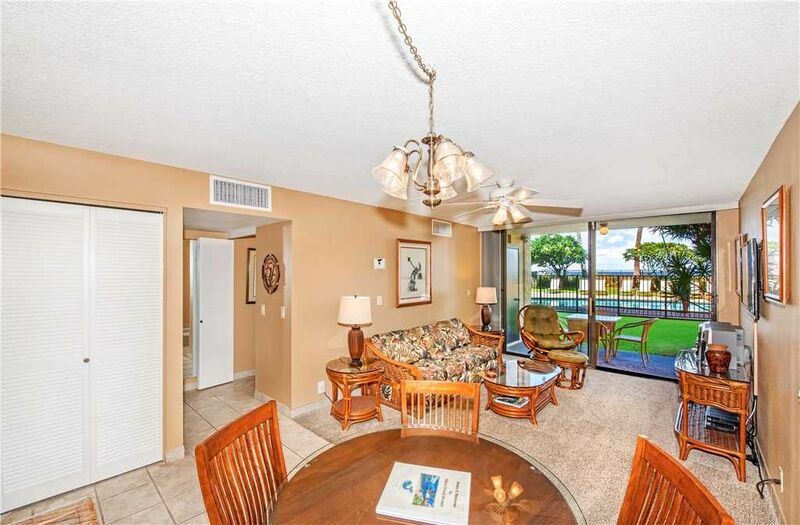 Kihei Resort is in a great location and the proximity to the beach and pool could not be better. A local ABC store, and small shaved ice stand and bakery right across he street were both treats.The beds were very comfortable and the kitchen was well stocked. Upon arrival there was a bad odor that we attritubuted to perhaps a foreign cuisine maybe left behind by the guest before us but it did reappear multiple times during our stay. The property had to be sprayed for bugs while we we there ( something that has to be done) but it would have been nice if they did it between guest. The biggest disappointment with the property was by far the pool. It was very dirty and not well maintained. Several times we went to the front desk and asked if it could be clean and they did have maintenance go out there daily but the pool was obviously in need of a major cleaning. Many other guest echoed the same sentiment. You literally could not see 5&#x2019; under water and here was black &#x201C;debrit&#x201D; covering much of the pool floor. Thank you for taking the time to write a review. We appreciate your feedback and will be sure to let the property manager know of your concerns regarding the pool and bug spraying. All of our units are inspected before guests arrive and no mention of this odor was recorded. We apologize for your inconvenience and hope you were able to enjoy your time here on Maui. Kihei Beach Resort was Perfect for Us! We have stated at this resort 4 times over the past 19 years and always have an amazing experience. This unit could use a little TLC - but was perfect for our vacation with our 4 grown children. Convenient with beautiful views and amazing beach that is not crowded. This is the only place we will stay on Maui! Thanks for staying with us! We're happy your family enjoyed the time you spent here. Aloha. Very clean unit. Would recommend staying here if you like a safe quite location to relax, great for the kids. Walk right out the back door and your in a grass area and a few steps to the beach. Thanks for staying with us! We're so happy that your family enjoyed your time with us. Aloha. Enjoyed the rental, newer carpet in rooms very nice. A few recommendations: we all felt the lighting in the bedrooms was very dim - higher wattage bulbs in lamps may help or lights on the ceiling fans. Unit floors were not clean, especially in corners, under cupboards. etc. Dryer lint screen was very full! Cleaners should check between guests. Light fixture on lanai is cracked and broken. Light fixture in living room/dining room need dusting and or washing. Sofa is VERY uncomfortable for sitting - recommend replacing. Mahalo for staying with us.Thank you so much for pointing these things out. We take our guest's feedback seriously and will be sure to fix these issues as soon as possible. We hope to have you stay with us again. Aloha.